Couroupita guianensis, commonly known as Cannonball tree, Ayauma tree and Sal tree, is a deciduous tree of the family Lecythidaceae, which bears edible fruit. 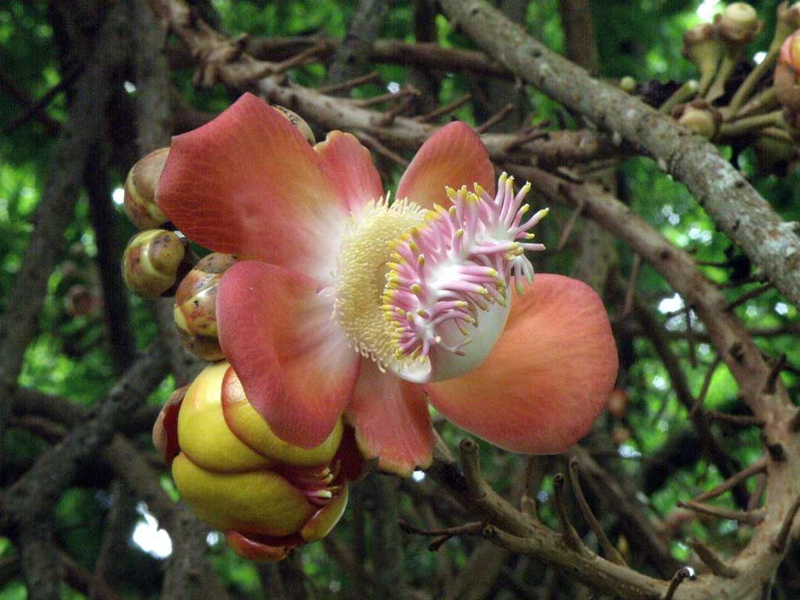 Cannonball tree is native to the rainforests of South and Central America. The Cannonball tree is found in the tropics such as in Thailand, India, Colombia, Bolivia, Costa Rica, Honduras, United States, Panama, Peru, Ecuador and Venezuela. It is planted as ornamental trees in the parks and highways. The single Cannonball tree bears 150 fruits and 1000 flowers having a strong scent especially in the morning and at night. Bats and bees are responsible for the pollination to take place. The flowers are mostly visited by wasps, bumblebees, flower bees and carpenter bees. 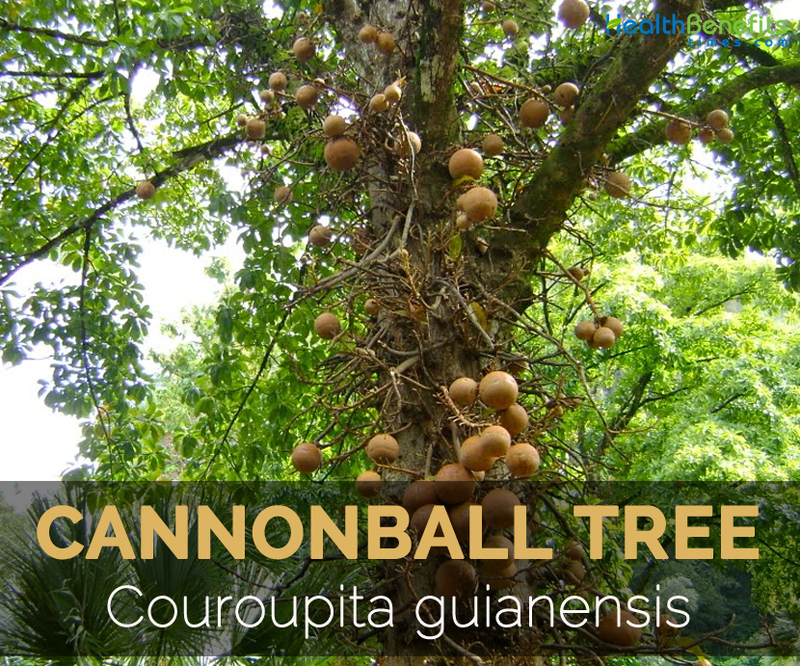 Cannonball is a large, deciduous and tropical tree which performs well in well-drained soils and grows upto 35 m high. It has simple, alternate arranged, oblong to obovate leaves which is about 10 inches long and 4 inches wide. The flowers are zygomorphic, yellow with red or pink measuring 5-6 cm across and 6 cm wide. 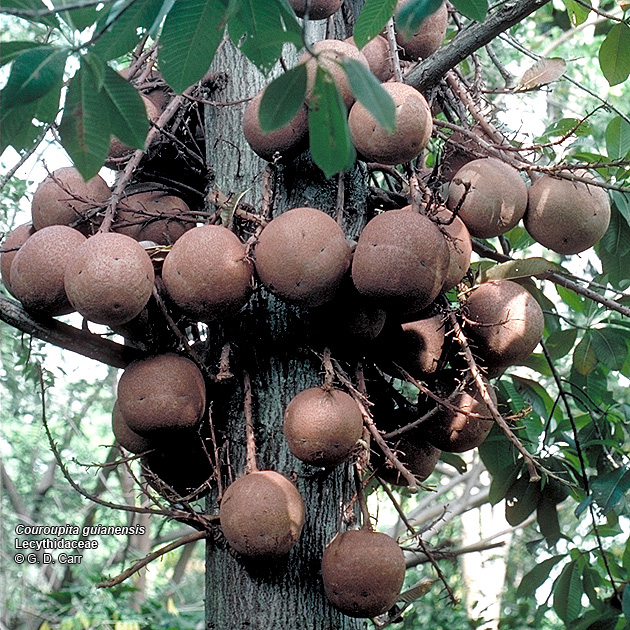 The woody, capsule fruits are globose, canonball shaped having 12-25 cm as a diameter. 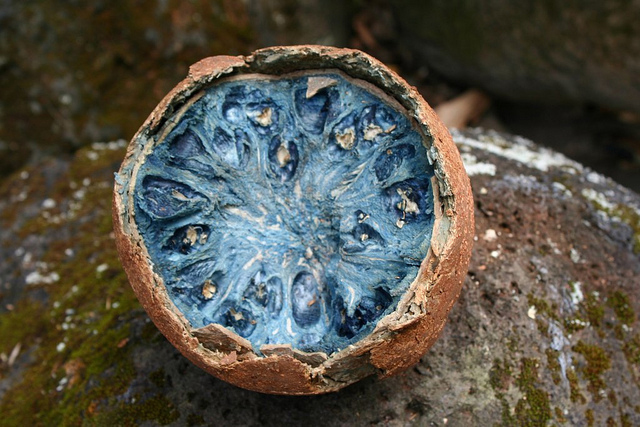 Each fruit contains 200 to 300 seeds. 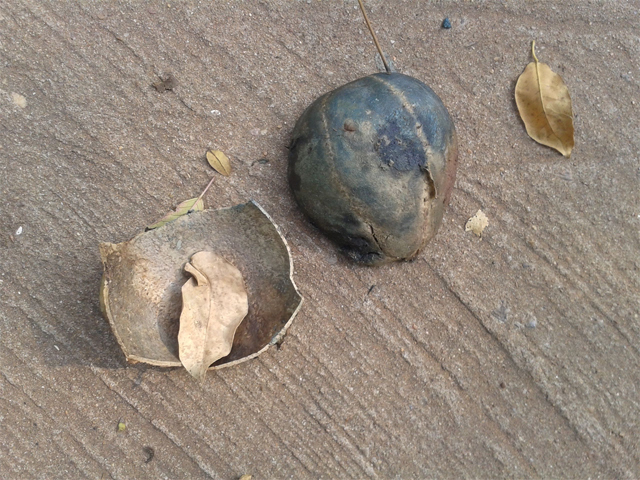 The fruit has hard shell and bluish to green flesh. 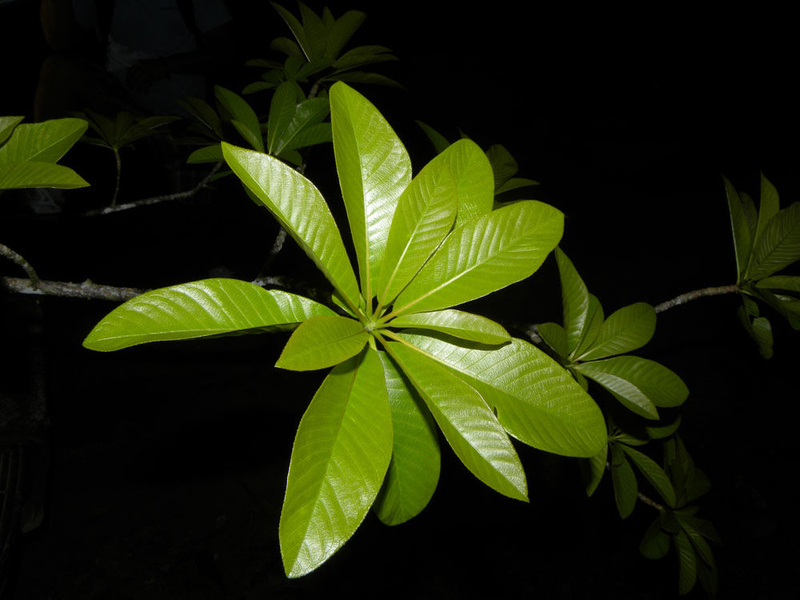 The plant extract is used to treat stomach aches and colds. In South America, the Shamans used tree parts to treat malaria. The pulp is used to disinfect wounds. Young leaves are used to provide relief from toothache. The bark is used to cure colds. 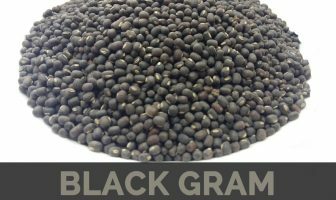 The extracts of the tree parts is used to cure pain, hypertension, tumors and inflammation. The juice extracted from leaves is used to cure skin ailments. Unripe fruit is harmful and might cause an allergic reaction. One who intake the unripe fruits may experience tingling and burning sensation on the lips and tongue. The flowers have good smell which could be used to add scent in cosmetics and perfumes. Fruits have hard shells which are used as utensils or containers. The pulp is used to feed muscovy ducks, pigs, turkeys and chickens. The wood of the tree is used to manufacture boxes, toys, rackets, parquet blocks, light artefacts and casting moulds. 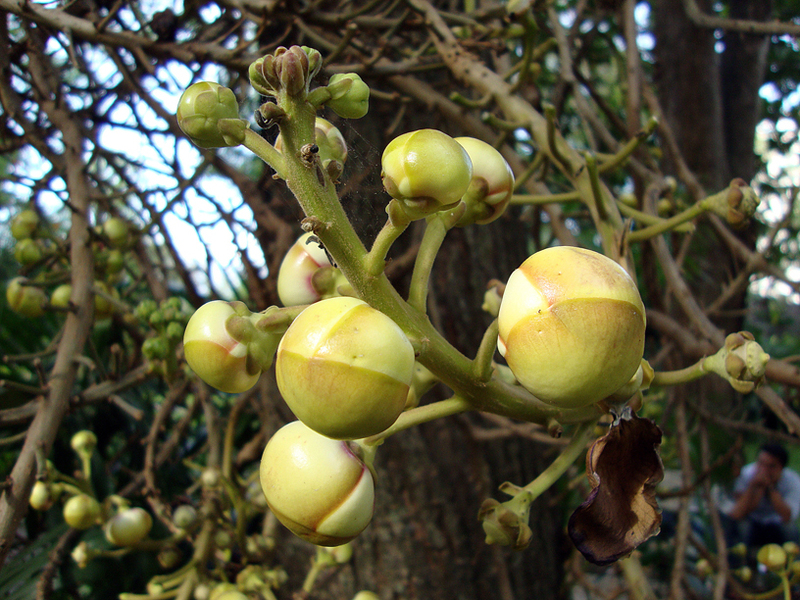 In India, Cannonball tree is regarded as a sacred tree by Hindus. According to the Buddhist scriptures, it is said that Lord Buddha was born on the shade of Sala Tree. The extracts of Cannonball tree possess antibacterial properties which is effective against E. coli, Staphyloccous and Bacillus. Fruit extracts also possess antimicrobial activity. The flowers are considered as a symbol of wealth in Asia. Pekea couroupita Juss. ex DC.